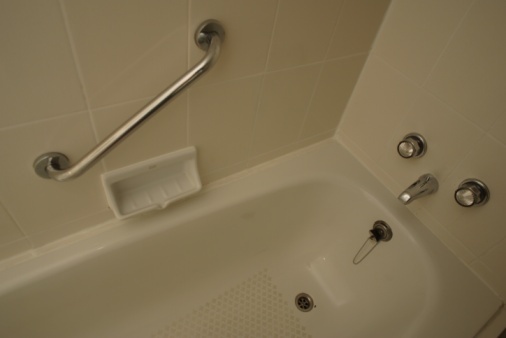 You can dramatically increase the value of your clawfoot bathtub by cleaning stains out of it. Antique clawfoot tubs are nearly always cast iron, which eliminates many cleaning agents as an option. The best way to remove most stains from an antique clawfoot bathtub is with a surprising cleaning agent that is likely to be in your medicine cabinet right now. Mix up a paste of hydrogen peroxide and baking soda. Sprinkle a thick layer of baking soda on each of the stains. Then, add a tablespoon of hydrogen peroxide at a time until you have created a thick paste that will spread but not run. Expect fizzing. Leave the paste on the stains for 15 minutes. If you are having trouble keeping the paste on the stains, you can saturate a cleaning rag with hydrogen peroxide and place that over the baking soda. You will probably be able to see many of the stains "lift" into the baking soda as the time passes. This is particularly true for hard water stains. Scrub the stains with the plastic scrubber. The plastic will not hurt the finish of the tub, but it will lift any stubborn marks on the cast iron. The baking soda will act as a gentle abrasive to help lift the problem spots. Rinse down the tub. 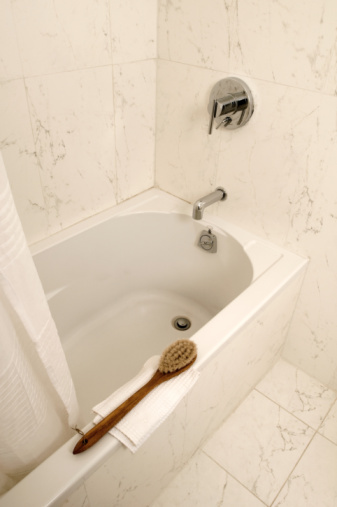 Use clean water and a cleaning rag to wipe down the tub and remove any cleaning residue. If necessary, you can repeat the stain removal process four more times to completely remove stains from the antique clawfoot bathtub.